While Al Gore’s Oscar and Nobel Prize winning film, An Inconvenient Truth, has serious students of climate change laughing their heads off, the British didn’t think it was very funny. The British High Court has ruled that it cannot be shown to students without first having a disclaimer that it is “propaganda”, instead of a “documentary”. Those Brits just don’t seem to have a sense of humor… or maybe they just think scaring little kids isn’t an honorable pastime. Nevertheless, the film makes a good outline for further discussion. Let’s start with those poor little Polar Bears, taking their swim in the vast, empty Arctic ocean, just before they drown. Carole “CJ” Williams probably sums it up best, so we’ll just quote her below..
Last March, global warming fanatic Al Gore used a picture of two polar bears purportedly stranded on melting ice off the coast of Alaska as a visual aide to support his claim that man-made global warming is doing great harm to Mother Earth. The one he chose, but didn’t offer to pay for right away, turned out to be a photo of a polar bear and her cub out doing what healthy, happy polar bears do on a wave-eroded chunk of ice not all that far from shore in the Beaufort Sea north of Barstow, Alaska. 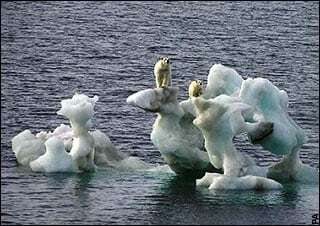 The picture, wrongly credited to Dan Crosbie, an ice observer specialist for the Canadian Ice Service, was actually taken by Amanda Byrd while she was on a university-related research cruise in August of 2004, a time of year when the fringe of the Arctic ice cap normally melts. Byrd, a marine biology grad student at the time, was gathering zooplankton for a multi-year study of the Arctic Ocean. Crosbie, who was also on the trip, pilfered the polar bear photo from a shared computer onboard the Canadian icebreaker where Ms. Byrd downloaded her snapshots; he saved it in his personal file. Several months later, Crosbie, who is known as an avid photographer, gave the photo to the Canadian Ice Service, which then allowed Environment Canada to use it as an illustration for an online magazine. Today that photo, with credit given to photographer Dan Crosbie and the Canadian Ice Service, can be found all over the Internet, generally with the caption “Two polar bears are stranded on a chunk of melting ice”. It’s a hoax, folks. The bears, which can swim distances of 100 miles and more, weren’t stranded; they were merely taking a break and watching the boat go by when a lady snapped their picture. Al Gore saw the picture shortly thereafter and contrived to use it in a presentation about man-made global warming that he staged at a conference of human resource executives on March 22, 2007 in Toronto, Canada. Of course, after those words were spoken, the audience, being under the impression that polar bears are in imminent danger, gasped with concern and sympathy for the plight of the poor, pathetic polar bear population, whose diet, by the way, can include convenient humans, though attacks, like wolf-human attacks, are said to be rare. , A crisis is a tiblerre thing to waste , and Michael Platt reckoned that, A risk tamed is a reward captured . There is more to look forward to than there is to fear when it comes to Climate Change. There are opportunities that will be realised in many sectors of the world’s economies. Rather than just trying to mitigate this risk, let us face this planetary emergency with courage and resolve, and create value. And a large part of this will be a paradigm shift in how we deal with everything in life, from energy use to waste management. The warmist proposed and active solutions are seriously detrimental to our general wellbeing, in so many ways. By comparison, there is little to worry about from “climate change” itself, whatever that might be!